After a great day off in Saskatchewan Crossing, we decide that we may as well hike a few kilometres out this evening. We have already racked-up a lot of spending here – buffets, poutine, ice cream etc. Time to cut the town strings! We leave around 5, and hike to Mistaya River. The water is deep and fast, with no bridge…and we have to ford it. I’m really nervous and skeptical, but Dan manages to find a reasonable place to cross that is roughly mid-thigh deep. We walk a couple hundred metres further and pitch the tent. Just before we fall asleep tonight, we hear a wolf howling in the most solemn, lonely manner. It doesn’t sound very far off, and we drink in the beautiful music of the wild, as we fall asleep. 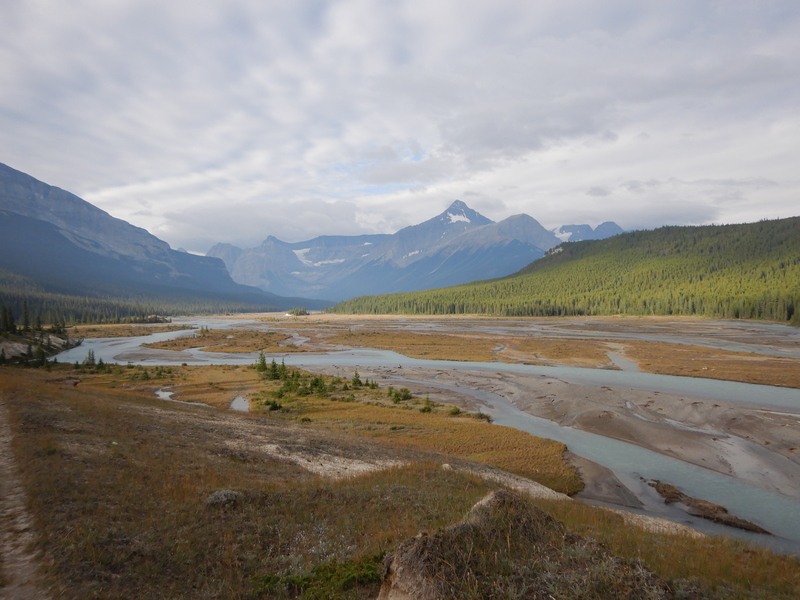 Today we hike the Howse River area, and up and over Howse Pass. We managed pretty good on our NOBO section, considering the trail is atrocious. 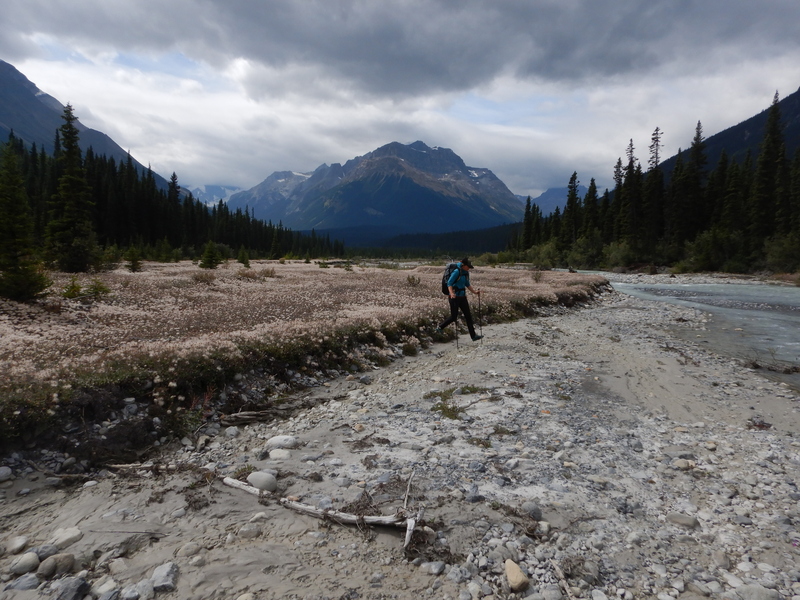 The key, however, is that we stuck to the river flats as much as possible, and barely used the actual trail. 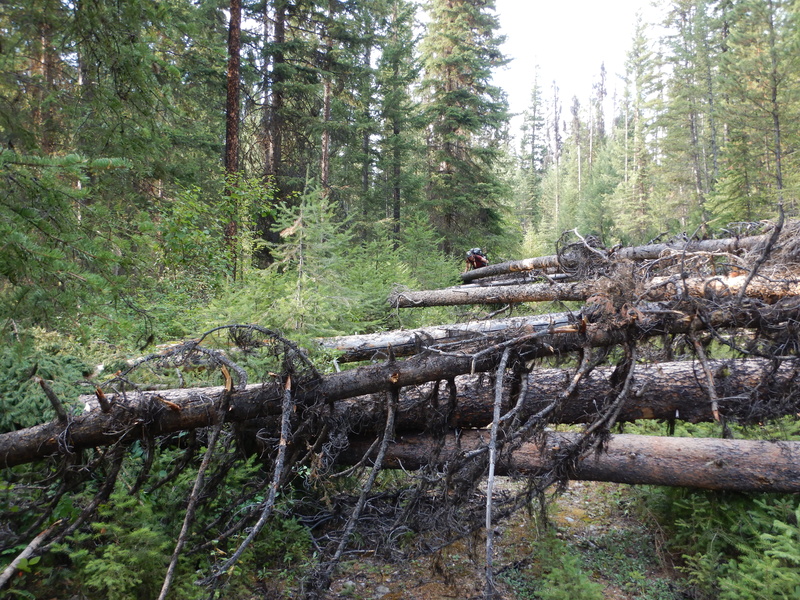 Parks Canada has not done trail maintenance on some parts of this trail for 26 YEARS. You can imagine what walking through that would look like! Turns out this time around, it’s a complete breeze. We averaged 4 km/hr, which is staggeringly better than the most commonly reported 1.5 km/hr, when sticking to the “trail.” Dan took a GPS track of our route, in hopes of providing it to future hikers. He was so happy at our speedy progress, and once again, I’ll proclaim that I am so blessed to have such a skilled hiking partner! I was OUT last night. I felt a little bit sick falling asleep, and woke up not feeling 100% – just mildly under the weather. There are no “sick days” out here, so I submit to my trail life fate. Today, like everyday, you walk! 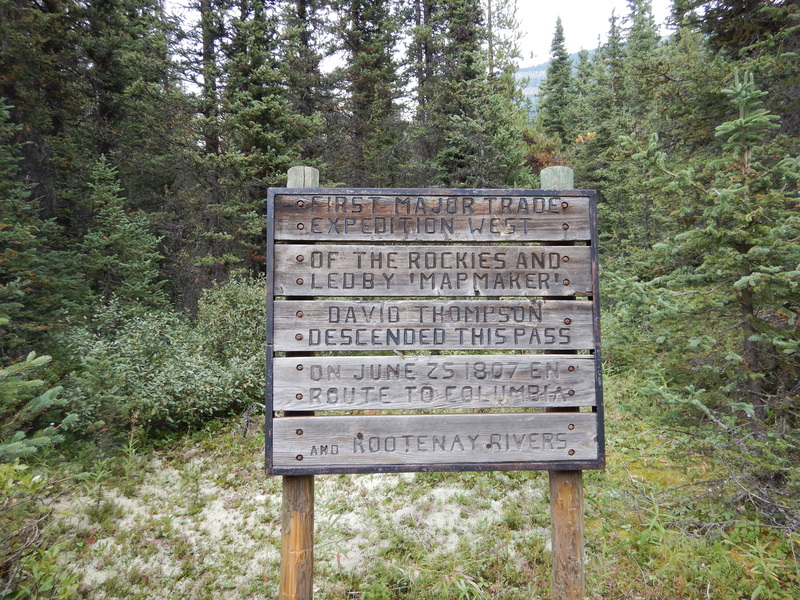 More precisely, today we walk the David Thompson Heritage Trail. It’s in dire need of repair, with willows and brush overgrowth, as well as trail erosion that falls right into the river it follows. It’s sad, really, because Mr. David Thompson deserves a trail fit for his contribution to exploration and map making. 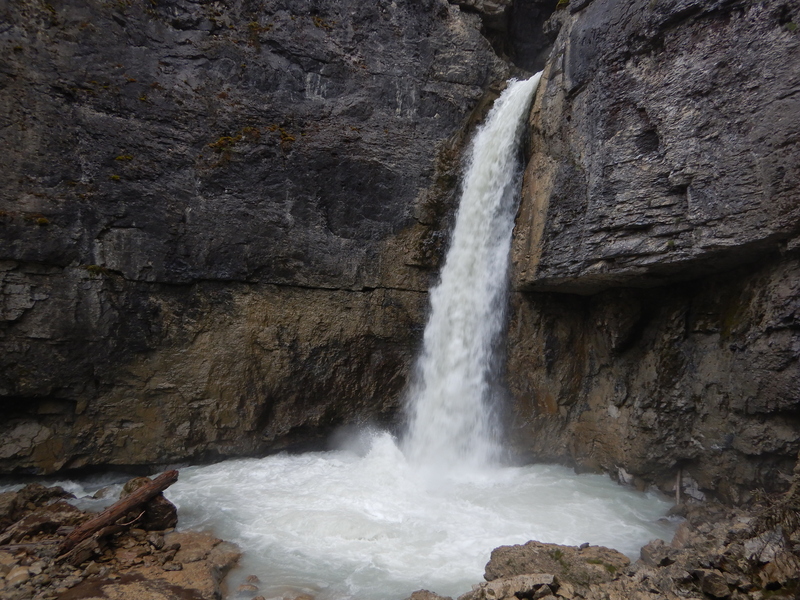 I guess on the positive side, this gives a sense of how he may have felt, pushing his ways through alders and fording gushing rivers, all in the name of exploration. Last time, a massive portion of this trail was either flooded with the high river water or was completely lost in the river itself. Today, the water is significantly lower, and we find it way more pleasant. We motor along, finishing the 7 kilometres in good time. Afterwards, We walk the flat and welcoming road and notice a black bear walking on the road towards us. He or she is completely oblivious to us, just sauntering along, minding their own business. The bear is, however, walking directly at us, so it’s time to make our presence known. A couple loud and deep yells did the trick, and the bear sheepishly scampers away. Later, we arrive at Blaeberry River. 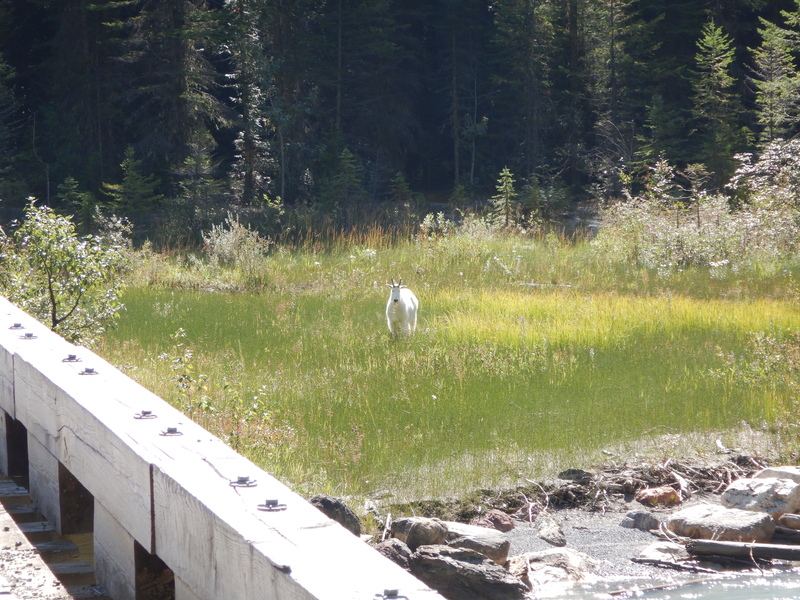 As we round the corner towards the bridge, there’s a large, lone mountain goat standing off to the side in some grass. It’s large, so we believe it is a male. Dan snaps a photo, and gets some video footage. Out of nowhere, the goat just decides to book it! He runs up the river bed at an alarming speed, and crashed into the deep and fast river, then out of sight. It was really impressive! We both wanted to see a mountain goat SO BADLY, and are all smiles from this encounter! Our “mega fauna spotting wish list” still includes wolves, foxes, and elk. Fingers crossed! 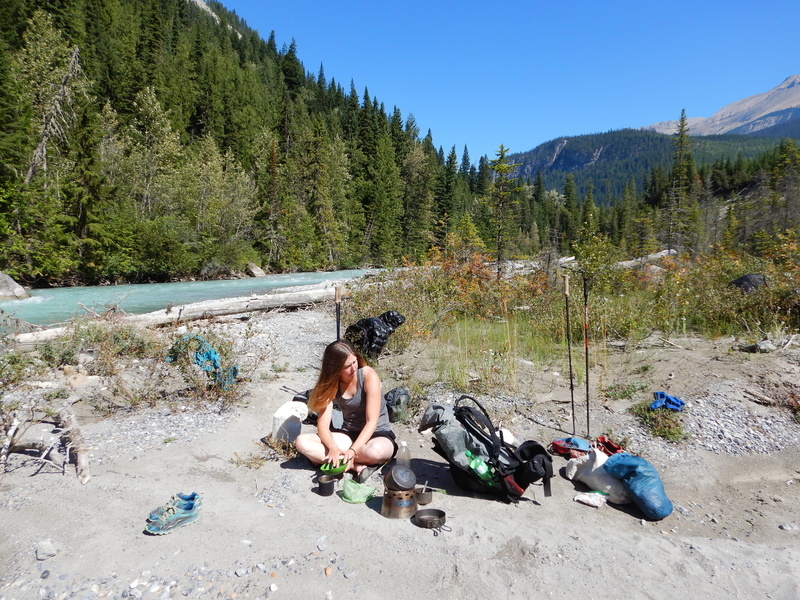 We bathe in the river, and enjoy a sunny lunch, complete with coffee. We have a 9 kilometre heft up a logging road, that climbs roughly 800 meters. It’s panning out to be a hot afternoon with blazing sun. I welcome the blinding sun, as I have craved her company for so long! Summer is almost over, and I want to milk these sweltering days that come too infrequently. My skin was a little pink from the sun worshipping afternoon, but it felt so good! 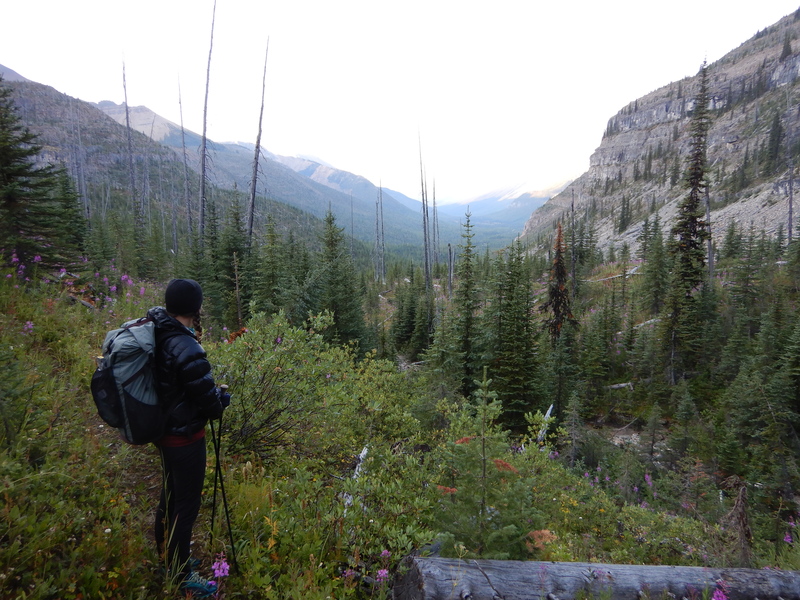 Having gotten all sweaty again, we rinse in a creek, and camp in the meadows at the top of Amiskwi Pass. What a perfect day, filled with sun and animals and exercise. 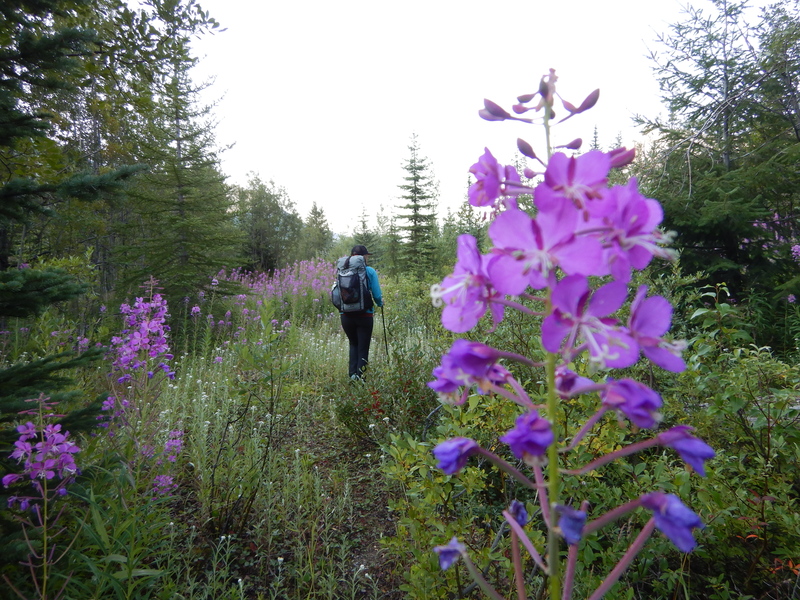 This trail life feels good on us, and as we draw closer to our trail end, we savour it all the more. We’ve got some distance to cover today, and the trail continues to be rough. 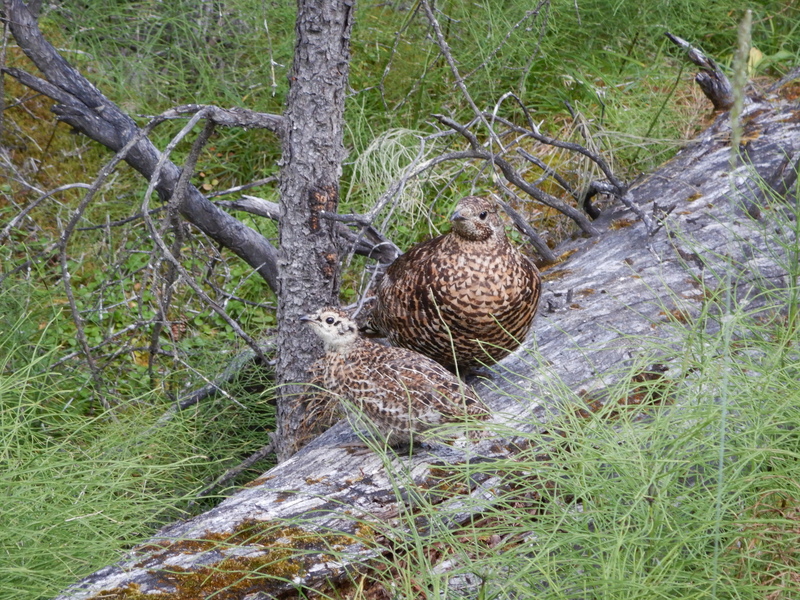 As we head down Amiskwi Pass this morning at around 7:30, we bump into Skyler (I think…?) who is section hiking. We actually met him last section when he was sectioning with two friends – remember the ones who told us about the cold Kokanees in the river? Yup, that guy. 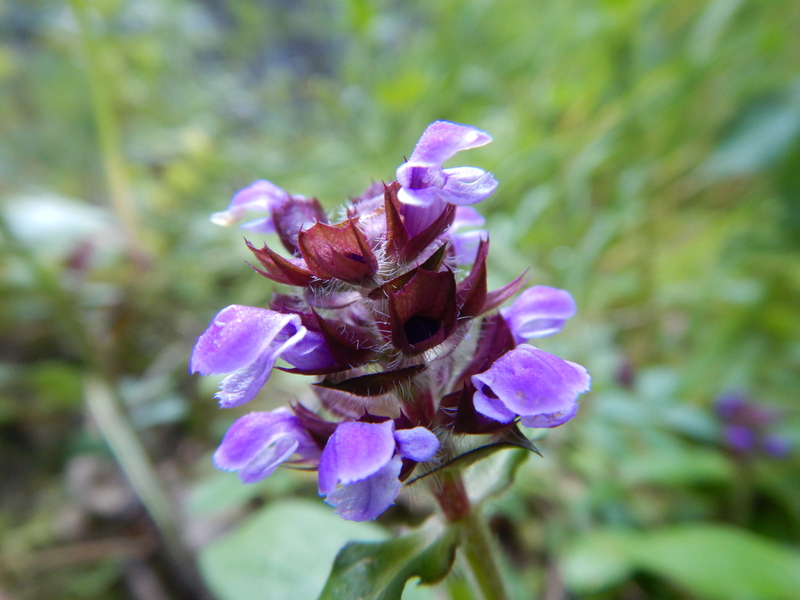 We chat for a while, geeking out on hiking gear and giving trail beta…the usual stuff. We walk an old logging road all day, that was built sometime in the first half of he century. Dan is really enamoured with the construction of it, inlaid with old rotting logs. It’s neat to see Mother Nature take back the trail. We change to shorts and t-shirts, despite the chaos the brush causes on our skin, because SUMMER. Don’t leave us sun! I’m super done near the end of the day, but only have a couple clicks to go. To our surprise, the trail has hit hard by a tree blown-down since we hiked it. There are impossibly high stacks of interlaced logs, presenting us with an obstacle-like endeavour. To saytheleast, I was not impressed as I teetered along the tight-rope-like balancing act. I want my restful tent so bad! 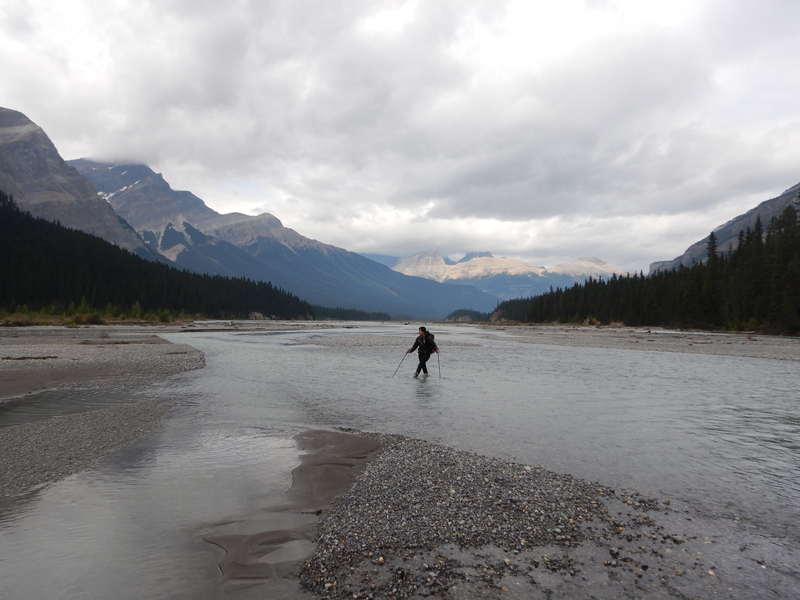 Of course, nothing lasts forever, and we emerge at the Kicking Horse River, where we set up camp. I rinse my puffy, scratched, bleeding legs in the cold, biting water. Sleep, glorious sleep! Just an anxious six kilometre jaunt to Field BC, praying we can make it before the impending rain clouds release their blessed water. Thunder echoes in the valley. Like typical mountain weather, it barely storms, as the clouds move fast and intent, but up a neighbouring valley. We won’t be down pouring on you today T-Fox! All grins. We grab coffee and fresh baked goods and our next resupply box. Tomorrow is our 11th wedding anniversary, and we start scheming that we would really like our van and the freedom and options that allots us. Our van is in Jasper…so it’s a decent hitch. But what the heck! Let’s do it. We dangle the thumbs and plaster on the smiles. We’re picked up within minutes by a local woman who picks up hitches all the time. She’s wonderfully animated as she talks about her beloved local mountain hikes, and I fall in love with the people of this area just that little bit more. 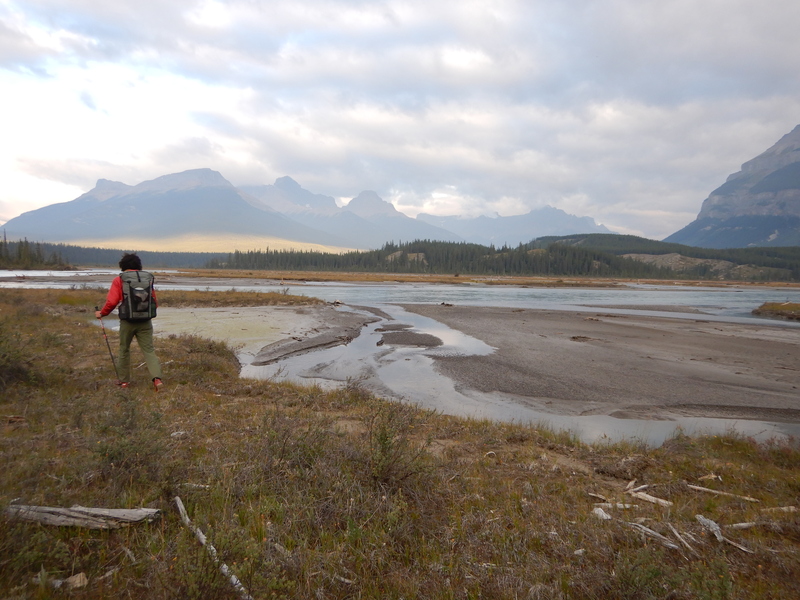 She drops us off at our highway cut-off to the Icefield Parkway. It’s 230 km to Jasper…a big hitch for sure! We completely luck-out by getting picked up within 15 minutes by a couple who are going beyond Jasper! They’re on their honeymoon, and they told each other that they were going to pick up hitchers today. They’re wonderful company for the 3 hour drive. In Jasper, we run into some section hikers we met on the trail! – Tristian and Mya. We all go out for coffee together and exchange trail stories. We get to sleep in our snug van bed tonight, and I am so grateful! Trail life makes one appreciate the little things – being warm and dry, a good sleep, good company, and being clean to name a few. Like always, it’s good to have a break from the “walk, eat, sleep, repeat” cycle of our trail life. So glad to hear from you, sounds as though you have recovered from your ankle injury. Enjoy the luxury, of fine Tic Tac liv’n!!!!! many earnest thanks to you and Dan. 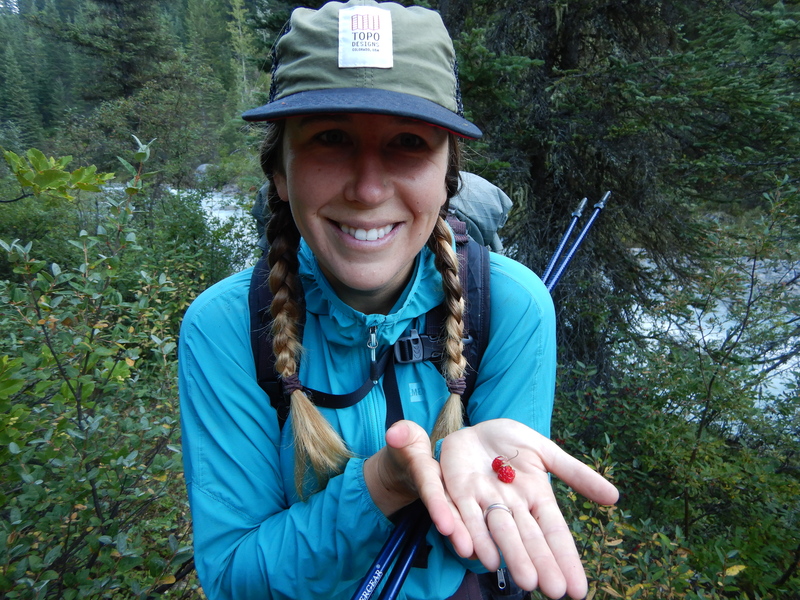 we think of you two often and I love reading about the different legs of your yo-yo; you have a lovely way of writing about walking and living on the trail.